I met Elizabeth and Danny years ago when we were all doing time, er ... working, at a restaurant. We'll leave that there, but we all moved on to bigger and better things. I was doing more and more wedding and portrait photography, and they were both working at local banks. One New Years Eve Danny decided it was time to take the next step and he proposed to Elizabeth! 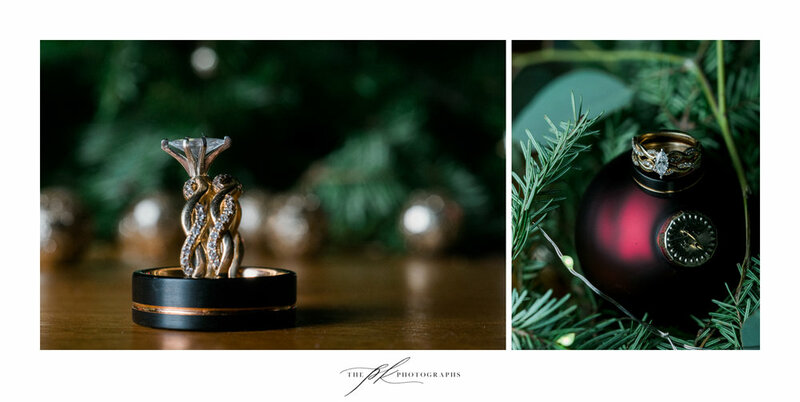 I was lucky enough to capture their engagement photographs that January, and we had so much fun I had to create two separate blog posts for their engagement photos, see Part I here and Part II here. When their wedding planning was in full swing their planner, Amanda Brown of Bluebonnet Events, stressed to them the importance of hiring a photographer they were comfortable with - and I completely agree. It's vital that you connect with your photographer, otherwise you'll look uncomfortable in your wedding photographs. I'm so glad Elizabeth and Danny decided to hire me - it was such a beautiful wedding! When I arrived at Magnolia Halle there was a lot of activity. Elizabeth and Danny were getting ready and all the decor was coming together! 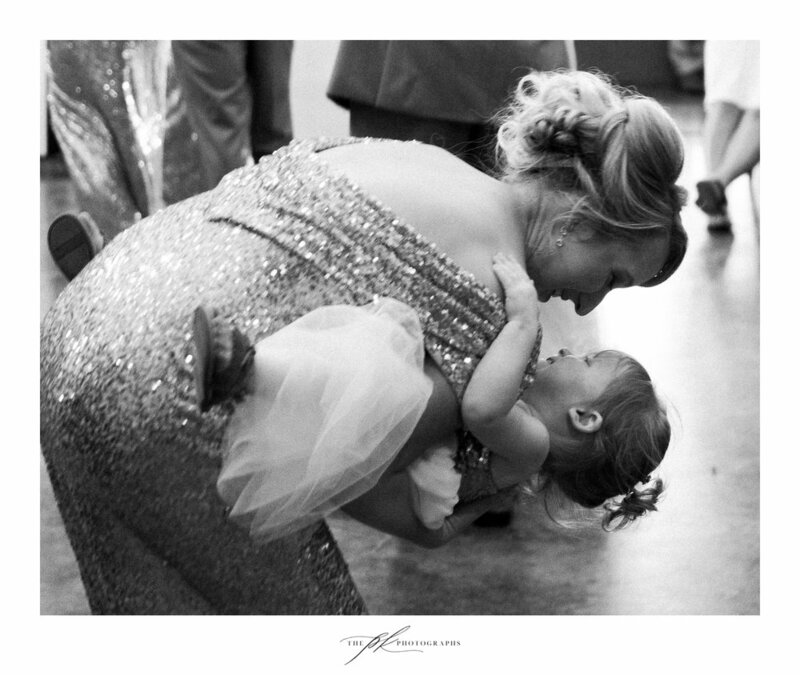 Elizabeth's mother helped her into her dress, and helped her fight back tears of joy. 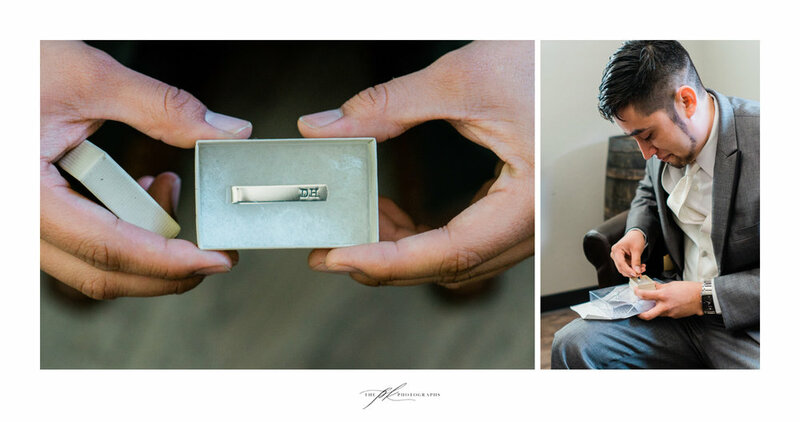 Elizabeth had a custom tie pin created for Danny in celebration of their wedding day, and her father's Air Force name badge sewn into the lining of her wedding dress. Less than an hour later it was ceremony time and Danny was in position while the bridal party walked across the small bridge to the ceremony area. Then everyone rose, and Elizabeth was walking across the bridge with her father. The huge smile on her face paired beautifully with Danny's emotional expression. After a short, bilignual ceremony led by Pastor John Feagins of La Trinidad United Methodist Church, we were finally introduced to Mr. and Mrs. Herrera! We had a few short moments for wedding portraits, while the guests devoured Pinks Popcorn and drinks at the patio cocktail hour, and then it was time to party! Danny couldn't resist kissing Elizabeth as they entered the reception hall to spend the rest of their evening with family and friends. Everything was decorated to perfection, too. Each table had a handmade boot in the center, made by Elizabeth's grandmother. A delicious dinner, hilarious (and heart-warming) toasts, cake cutting, and dancing kept everyone busy all night long! The photobooth was a huge hit and it was clear no on wanted the night to end. We finished off the evening with a gorgeous sparkler exit! It was such an emotional day, and it was an honor to document it. 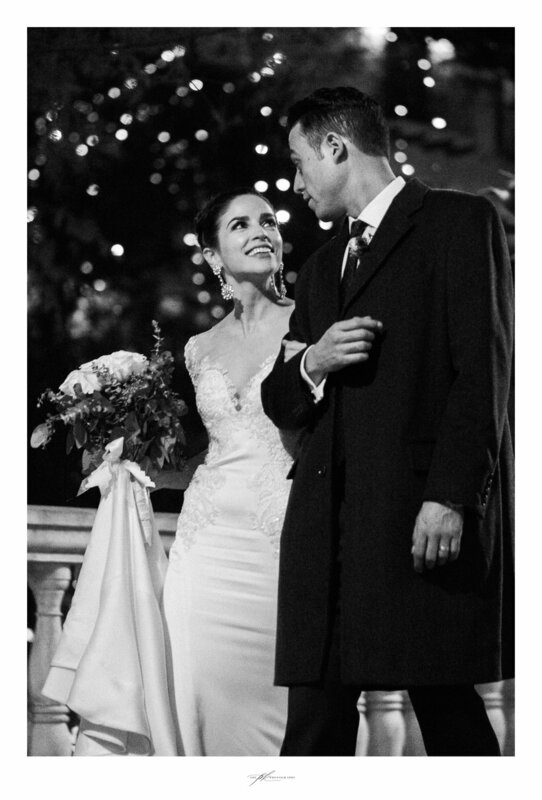 Watching Elizabeth's father when he first saw her in her wedding dress, the look on Danny mother's face during their mother/son dance, and most importantly the way Danny and Elizabeth looked at each other so many times through the day. It was a dream of a wedding. Wedding ceremony at San Fernando Cathedral in San Antonio, Texas. This past winter I had the opportunity to photograph a wedding as a second shooter for my friend Adam, another local wedding photographer. Some wedding photographers view second shooting as beneath them, since it's how a lot of photographers get experience with wedding photography, but whenever I have free dates I love to second shoot with other local photographers. It's a great way to try out new kinds of shots, get more experience at different venues, and of course - simply become a better photographer! 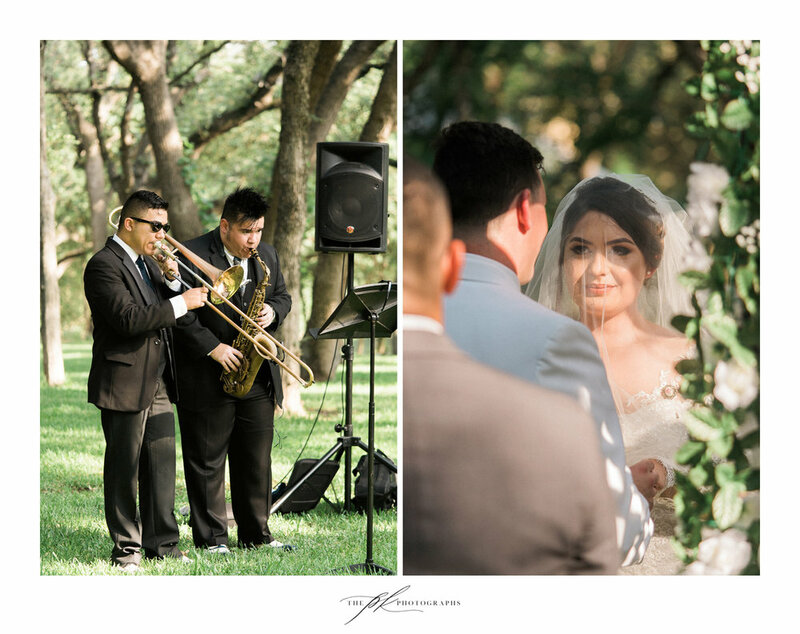 As Alejandro and Ashley aren't my clients I can't tell you very much about them or their wedding, but I do want to share a few images from their magical day for a few reasons. First - because how can I not share images from a wedding I've shot, and second, because I love their venues. If you're from San Antonio you know of San Fernando Cathedral, across from City Hall. What you may not know is that it is the oldest church in Texas (even older than the missions). It's a beautiful cathedral, and it's easy to photograph. Some churches are so tight and it's impossible to move around, but not at San Fernando Cathedral. After a full Catholic ceremony, we walked downtown to their reception at Bohanan's. Their friends and family filled the room that was beautifuly decorated. White roses, gold accents, and wine all around. Heart-warming toasts, a romantic first dance, and an atmosphere of love and excitement filled the room until the end of the night. 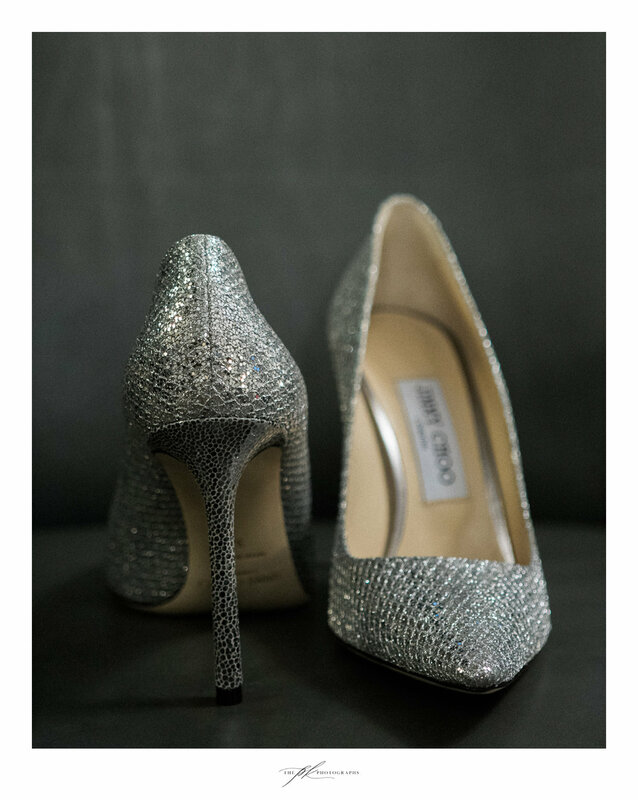 Jimmy Choo silver bridal shoes. Bride and groom's silver wedding ring set. Bride and groom downtown San Antonio. 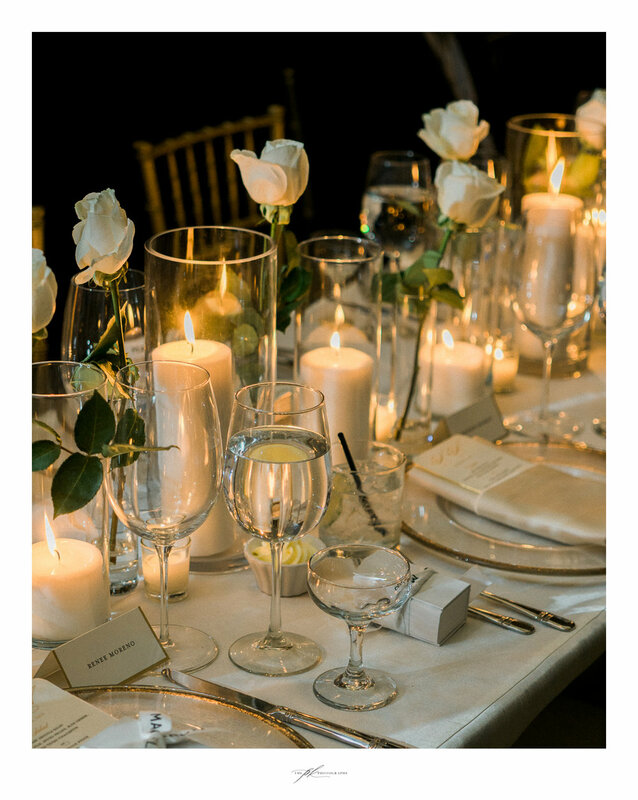 White rose and gold accent wedding reception decor. The groom toasting at his wedding reception. The bride being toasted during her wedding reception. The bride laughing during toasts at her wedding reception. Christmas themed decor and wedding rings at the Chandelier of Gruene. Christmas season weddings are nothing short of amazing. Beautifully decorated, an already festive time of the year is all the more celebratory when a friend or family member is getting married! Emily and Lamar tied the knot on December 23rd at the Chandelier of Gruene at sunset. I arrived early in the day, excited to see Emily, her mother and grandmother again (if you missed my blog post about Emily's bridal portrait session then you've missed the first part of my story of Emily's wedding, and you should check it out really quick) and even more excited to meet the rest of the family and friends who would be there. The majority of the early afternoon was spent in the bridal suite with Emily and her bridesmaids as My Makeup Movement worked their magic on everyone's hair and makeup. The reception hall and chapel were being set up beautifully with flowers, candles and lanterns, and garland with burgundy and gold Christmas ornaments and twinkle lights. 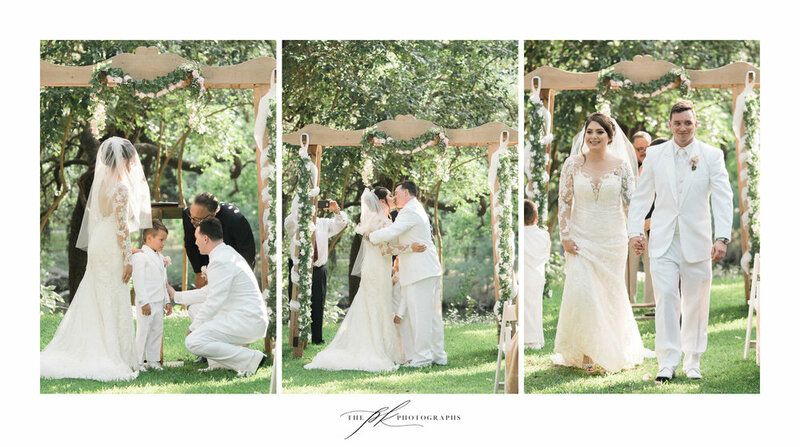 After a few bottles of champagne had been passed around (and if you haven't tried Messina Hof's almond champagne bottled locally in the Hill Country, you are missing out), Emily was ready to get into her wedding dress and have a first look with her father. With the help of her bridal party, her mother and a few other eager family members Emily was on the porch walking up to her dad, who was holding his breath before seeing his only daughter for the first time, on her wedding day, in her wedding dress. Anyone who knows Jeff, Emily's father, will not be surprised by the pure joy and love on his face in that moment. The guests had already started arriving, and before we knew it, they were all sitting down in the open air chapel with an air of excitement and anticipation that not even the cold weather could distract from. Lamar, the officiant, and the parents and grandparents of both the bride and groom entered before the rest of the bridal party. Finally, there were only two more people to enter - Emily and her father. The guests stood and craned their necks, cell phones ready to capture that first glimpse of Emily on her wedding day. Lamar waited patiently (or at least, he looked like he was trying very hard to be patient) at the front of the chapel with a smile on his face he couldn't have hid if he had wanted to. Jeff walked Emily up the aisle to her groom, and the wedding ceremony was underway. Marriage advice, prayers, and a poem written for Emily and Lamar were read before the rings were exchanged and they were pronounced, at last, Husband and Wife! I've never seen anyone so eager to kiss his bride, and the second he was instructed to do so Lamar had Emily's lips against his. He even took a second kiss, playfully flipping part of her veil over the two of them to much laughter, before they walked out of the chapel, hand in hand, ready to face this world together. After a few quick family portraits, it was time to get the party started! Bride and groom entered the reception hall with a few twirls under the main chandelier on the dance floor, and the evening was officially started. Dancing, toasts, dinner, and the cutting of their simple, but perfect, cheesecake, took place in what felt like the blink of an eye. All evening, the room was full of good conversation and that atmosphere of "love" and "family" that is so quickly felt during the holiday season. 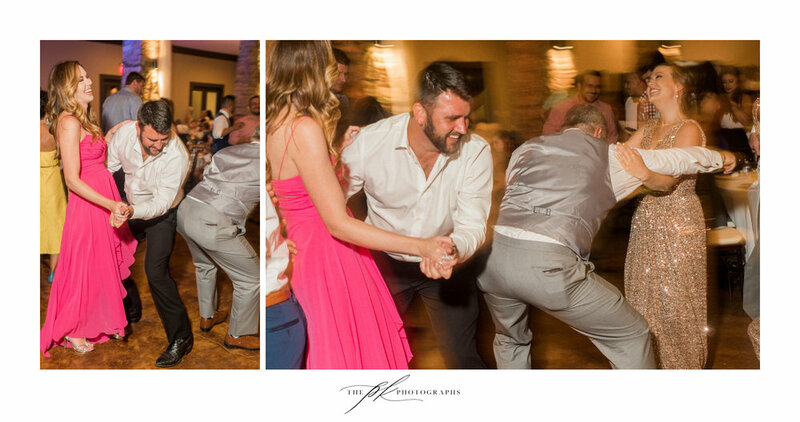 I was amazed at the energy of Emily, Lamar and their bridal party - the dance floor was never empty. They were frequently joined by their parents and grandparents, as well as may other guests, as they celebrated the pure joy and excitement of the day. 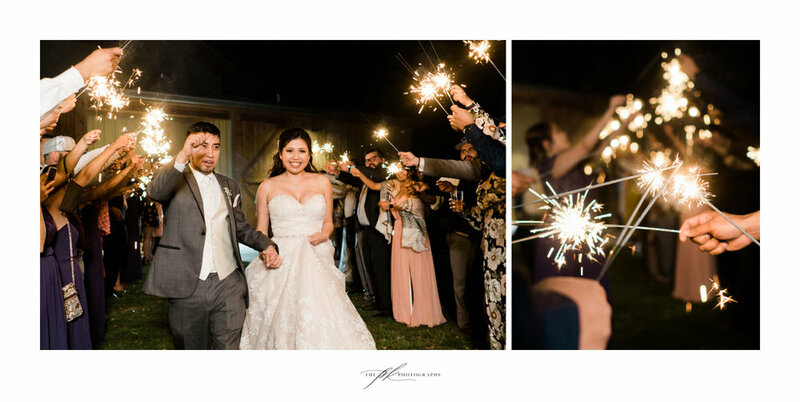 At last, the evening drew to a close, and it was time to send off Emily and Lamar in style, with a sparkler exit. Guests lined the path outside the reception hall, and for the last time that evening they cheered the newlyweds as they left their wedding day, on to the first day of the rest of their lives. Emily having the final touches on her makeup finished by My Makeup Movement. Champaign is baiscally a must during hair and makeup! Flowers all lined up, waiting for the ceremony time. 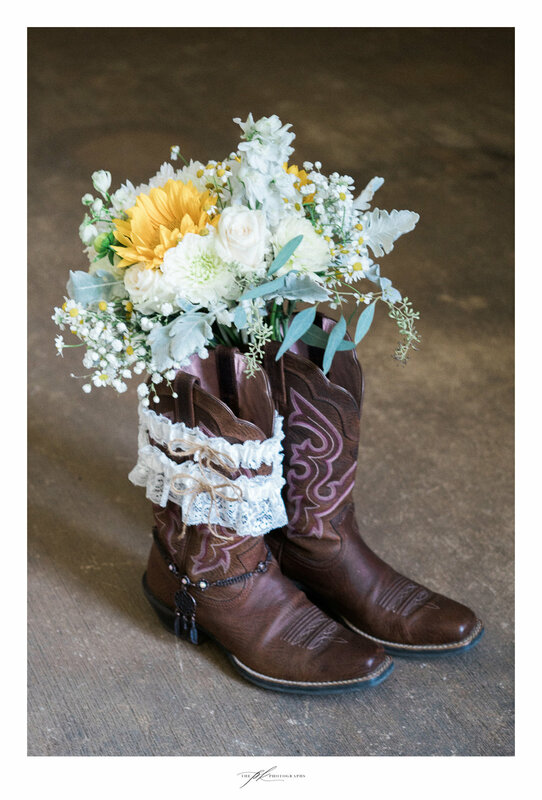 Cowgirl boots and flowers, important parts of any Texas bride's wedding day. Hair and makeup time before the wedding ceremony. Emily had a little pre-wedding ceremony fun with her bridesmaids on the porch at the Chandelier of Gruene. Emily getting ready at the Chandelier of Gruene in the bridal suite. 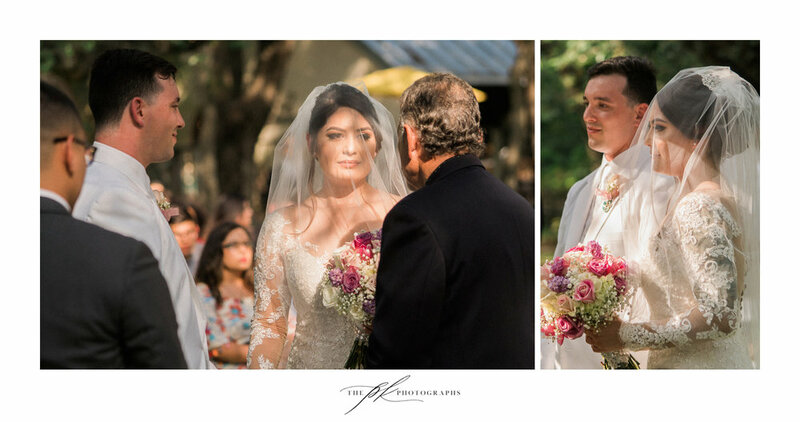 Once ready, Emily had a first look with her father on the porch at the Chandelier of Gruene. Lamar's clothing for the day waited for him in the groom's suite, at the Chandelier of Gruene. Emily and Lamar both soothed their pre-wedding jitters with a bit of encouragement and support. The beautiful open air chapel at the Chandelier of Gruene. Emily and her father ready to walk up the aisle at the Chandelier of Gruene. Emily and her father walking up the aisle at the Chandelier of Gruene. Emily and Lamar outisde the open air chapel at the Chandelier of Gruene after their wedding ceremony. Emily and Lamar inside the open air chapel at the Chandelier of Gruene after their wedding ceremony. Christmas themed decor in the reception hall at the Chandelier of Gruene. Emily and Lamar entering their wedding reception at the Chandelier of Gruene. Emily and Lamar shared their Mother / Son and Father / Daughter dances with the rest of their guests. Christmas themed cheesecake table at the Chandelier of Gruene. Emily and Lamar cutting their wedding (cheese)cake. Toasts, both heartfelt and hilarious, celebrated the new couple. Emily and Lamar spent a good portaion of their wedding reception on the dance floor with their guests. Family and friends kept the celebration going as they danced with their loved ones on the dance floor. The photo booth setup at one end of the reception hall. Guests prepared to wish Emily and Lamar farwell during the sparkler exit at the end of their wedding reception at the Chandelier of Gruene. Emily and Lamar's sparkler exit at the end of their wedding reception at the Chandelier of Gruene. When I first met Emily, her mother, and grandmother back in November it was to capture Emily's bridal portraits. I instantly fell in love with their family, and I knew it would be one of those weddings that would be so difficult to pick my favorite photos from and so difficult to blog about because I knew I'd want to share everything about their love, their family, and the wedding day to the world. Sure enough, I can't come close to narrowing down the images her wedding to Lamar to a reasonable number to post. I can't even pick just a few of my favorite images from Emily's bridal session to share. Emily wanted to capture bridal portraits at her wedding venue, The Chandelier of Gruene. This is a beautiful new wedding venue in New Braunfels, just a few minutes out of San Antonio. This session was my first time shooting at The Chandelier, and I'm so glad Emily decided to have a bridal shoot. The wedding ceremony was timed to be right at sunset, so we weren't going to have many opportunities to capture Emily's bridal beauty in the gorgeous outdoor areas of the venue on the wedding day. This is a perfect example of why pre-wedding bridal portrait sessions are so popular (and so important, if you want to be able to look back at the details of your wedding day look after the fact). So we arrived at Emily's wedding venue right before golden hour, and as she got into her dress with her mother and grandmother's help, I scouted around the property to pick the best areas for photos. I had to get some backlit images, the sun was too perfect as it streamed through the trees, and I knew we needed some "Texas" images as Emily was wearing cowgirl boots. My favorite image of Emily came from an idea her grandmother had, to feature the gorgeous chandelier in the reception hall in the portrait. 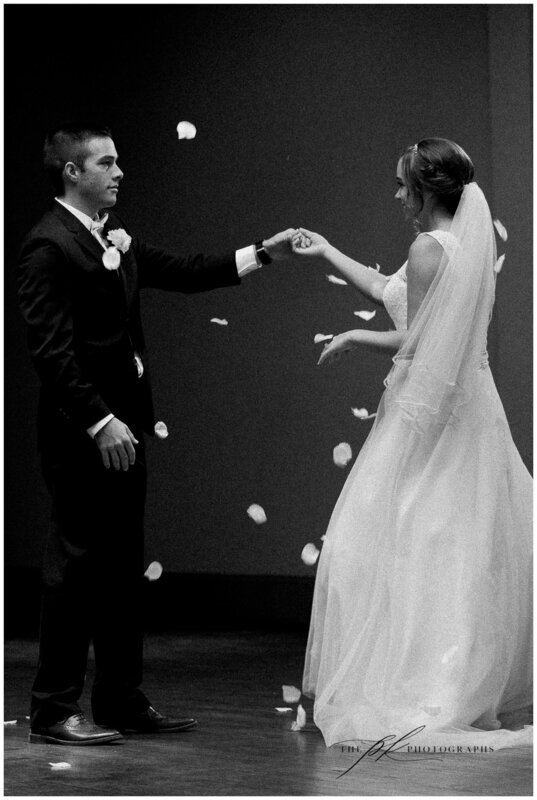 It ended up being Emily's favorite portrait as well, and she ordered a canvas print of it to place outside the reception hall during her wedding. Emily's veil and custom designed engagement ring. Katie and Matt at Magnolia Halle, a San Antonio wedding venue in the heart of the city. The great thing about the end of the year is that it's a very busy time for photographers. 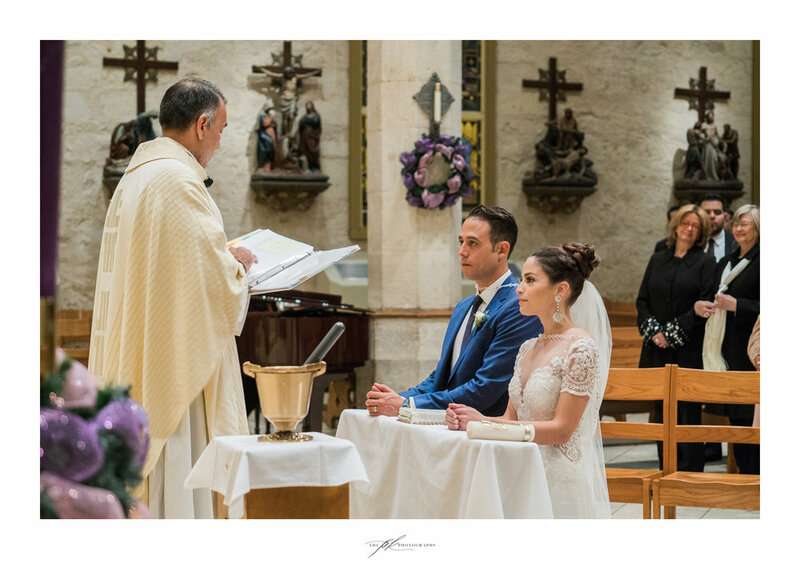 In San Antonio, October and November is the "second" wedding season of the year (as most couples opt for a spring or fall wedding, instead of a summer one). Unfortunately that means I'm staring at a complete backlog of blogs to post, so this isn't a full wedding blog post - it's a few of my favorite images from Katie and Matt's wedding. Their ceremony was held at the Shepherd of the Hills Lutheran Church. They chose this specific church because they were in love with the building, and upon hearing that I knew we needed at least one shot of them with as much of the church in it as possible. Three tall palm trees caught my attention, and before I knew it I was in one of those weird wedding-photographer-positions, laying down on the sidewalk, trying to get as much of the building in the photograph as possible. Katie and Matt after their ceremony at Shepherd of the Hills Lutheran Church in San Antonio. Once all the guests were on their way to the reception we went back inside the church for a few last photos there. The grand piano was just calling to me and was the perfect spot for Katie's bouquet, and I've always wanted to experiment and include stained glass in wedding portraits. We had a few quick moments to play around before it was on to the reception, but we had to make one pit stop first ... at Whataburger! It really doesn't get any more San Antonio than stopping at Whataburger on your way to your wedding reception! It was really cute watching the employees's faces when Katie walked inside in her wedding dress! Whatabride - Katie decided to stop at Whataburger on the way to their wedding reception. Finally we were on our way to the reception, where I snagged a few different ring shots (of course) and these beautiful portraits. Even though Magnolia Halle is right smack-dab in the middle of the city you'd never know it from the portrait locations. 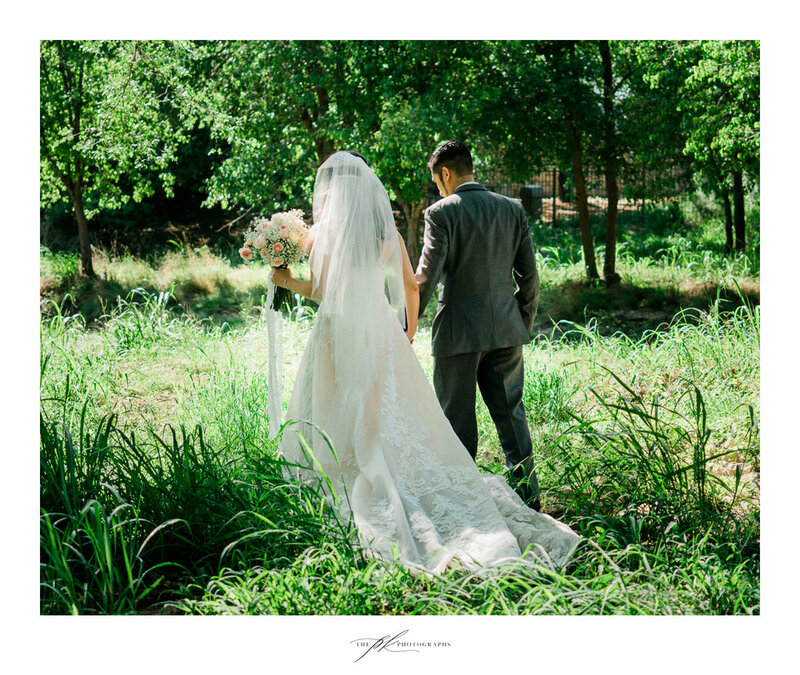 It's almost impossible to find a beautiful reception venue within San Antonio city limits that has beautiful, nature-filled areas to take photos in. It really was a beautiful location, and an amazing wedding! Katie and Matt's wedding ring set. Katie at Magnolia Halle, a San Antonio wedding venue in the heart of the city. As I was leaving San Antonio for Courtney & Shane's wedding in Boerne, followed by a reception up in the Hill Country, I couldn't have anticipated the sheer beauty I was about to witness. 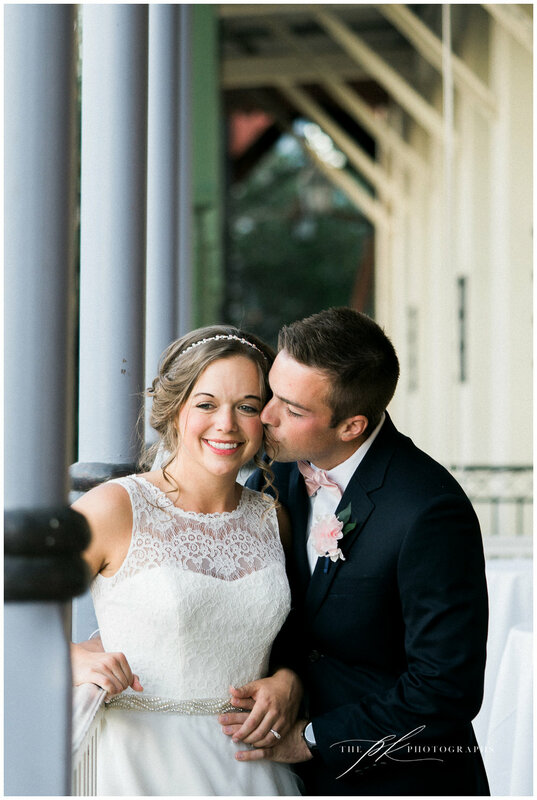 Most weddings are romantic and a little bit emotional, but everything was perfect with this one! 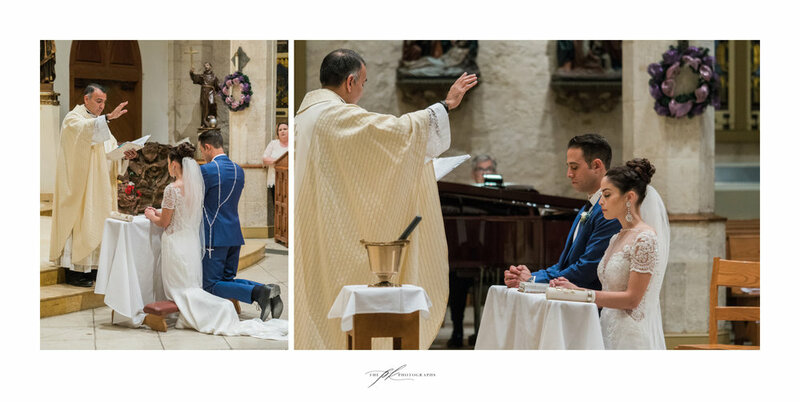 We started the day with a wedding ceremony at one of my absolute favorite churches to shoot at, St. Peter the Apostle Catholic Church in Boerne. Most churchs are dark, and a little more challenging to photograph in, but not this one! 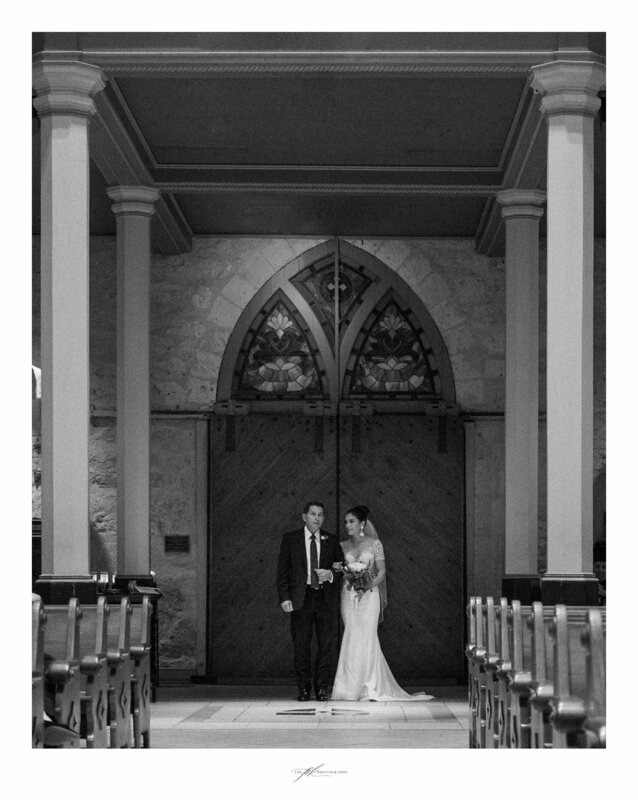 With huge, gorgeous windows all along one side of the church & skylights to let in light from above, it's seriously a great pick - from a photography standpoint! Another reason I'm totally swooning over this wedding is I was able to shoot it both film and digital! There is just something that film can do with the light that totally blows me away every time. I'm falling in love with the beauty of film grain and the artwork it's letting me create. It's not impossible with digital, it just takes a lot more time and effort to get similar results to what film can give me in just the push of a button. After a lovely ceremony we took a few family portraits at the alter before heading up to the Lodge at Country Inn Cottages for more photos, and the wedding reception! I love this venue because its perfect for outdoor portraits and the interior is always so beautiful as well, it can be decorated so many different ways and always looks stunning! The reception just flew by, with dances, dinner, tearful toasts, and as soon as the cake was cut (be sure you check out the Texas A&M Groom's cake! ), it was time to get the party started! 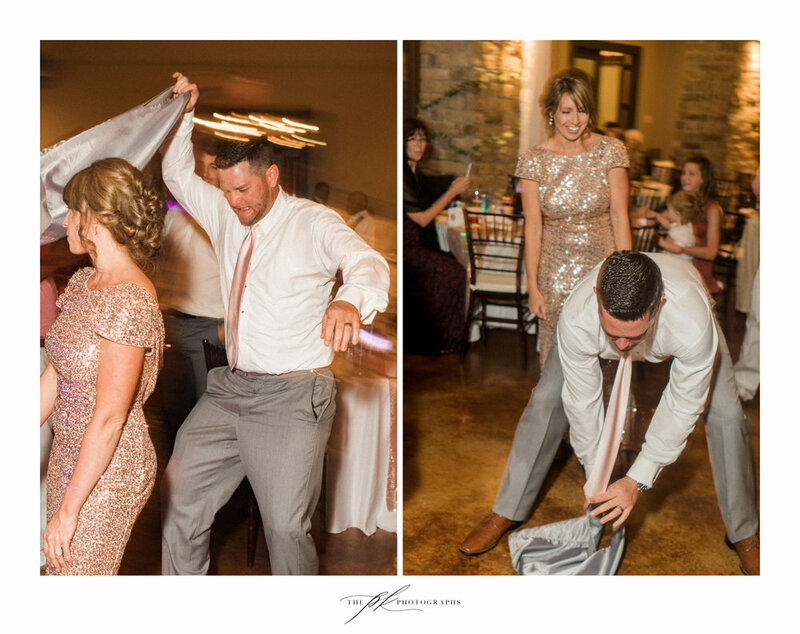 This is one wedding where they know how to have fun, that is for sure! The guests didn't stop dancing all night long, and the sparkler exit seemed to come too soon. When you're having such an amazing evening you never wanted it to end! Being handed off by Dad is one of my favorite parts of the wedding ceremony. The end of one part of life, and the beginning of another! 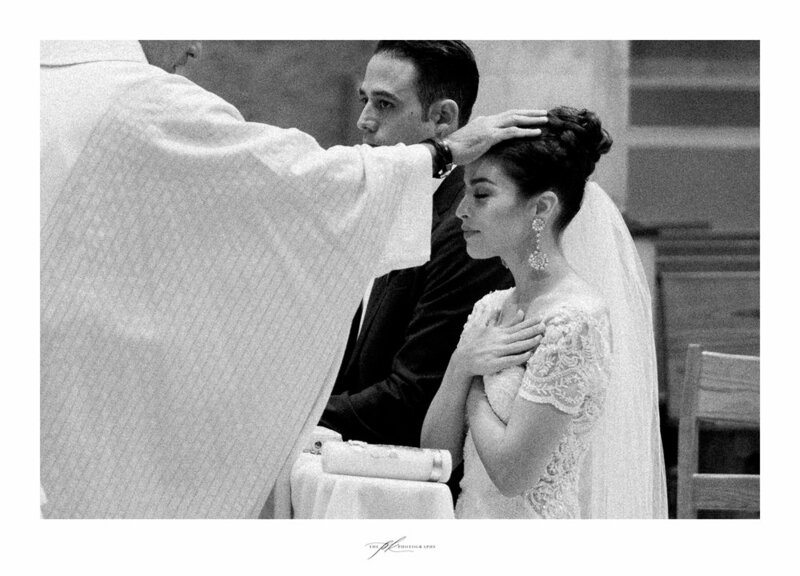 Courtney and Shane were blessed by the priest at the alter during their wedding cermeony. A stunning wedding ceremony, surrounded by their closest family and friends. Finally - the kiss sealing their weddingvows as husband and wife, and the walk up the aisle at the end of their wedding ceremony! The decor at the church was kept simple, just floral arrangements, but it was beautiful. The sunset, the trees, and a couple deeply in love! 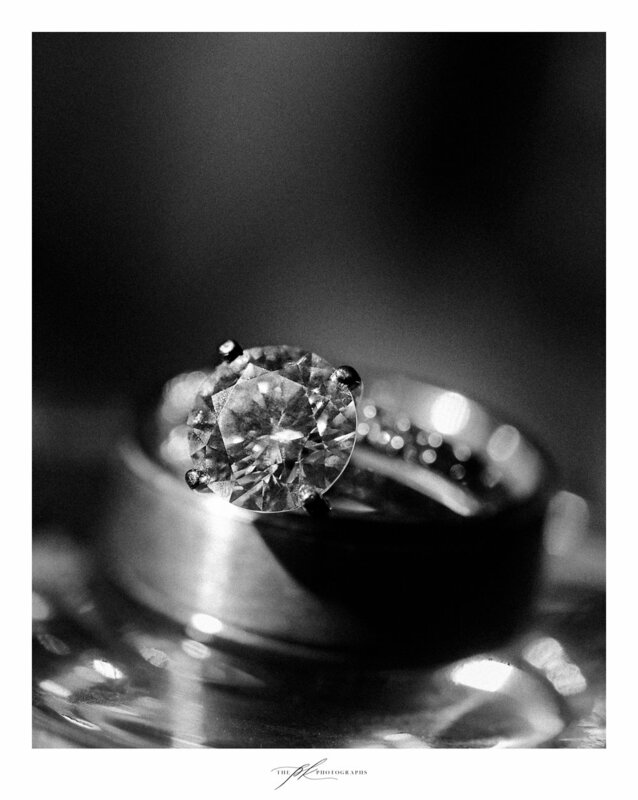 That stone was one for the books, I seriously couldn't have enjoyed shooting this engagement and wedding ring set more. Pure beauty! Such a beautiful couple during portrait time. Centerpieces and overall reception decor were nothing short of perfection! A little bit of country, fresh flowers, candles and engagement photographs. The newlywed's first dance was cute as they spun around the dance floor, surrounded by their bridal party. The cake table was beautifully decorated, with ivy and engagement photographs, and of course two beautiful cakes! ... but she was very careful to make sure she set the standard for not smashing it in his face! Such a beautiful wedding cake, and of course a perfect Texas A&M "beer cooler" groom's cake! Once that dance floor opened up, the party never ended! The Bridesmaid (sister of the bride) and Flower Girl (niece of the bride) took their turn on the dance floor as well! I spent most of the evening laughing so hard as the groomsmen really make sure all the guests were having a fun evening! It's so much fun to photograph a wedding where the bridal party and guests are dancing to this degree! Seeing this super cute LGBTQ+ couple on the dance floor totally melted my heart, usually I don't get to interact with my fellow LGBTQ+ family at weddings! Ah, the beauty of a sparkler exit. Nothing compares! The best thing about living in San Antonio is being right next to all the Hill Country venues, it's the best of both worlds when you're a wedding photographer. 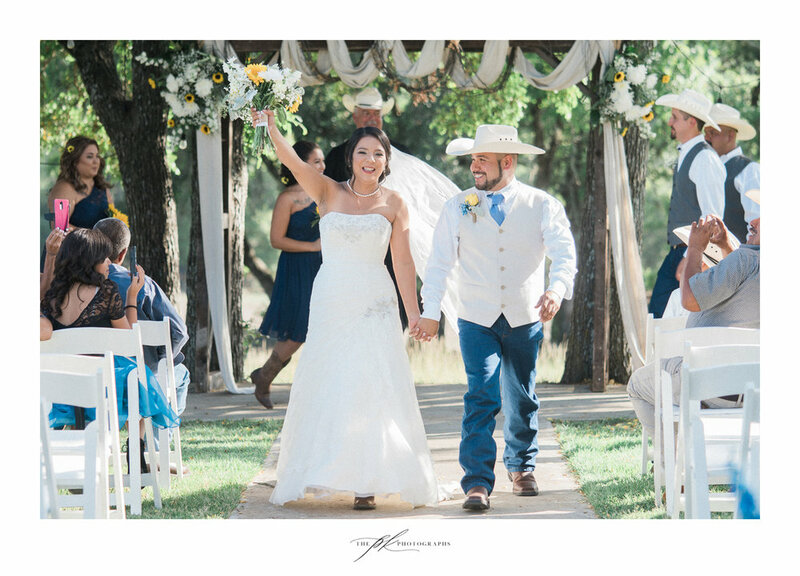 Erica and Victor decided to get married at the CW Hill Country Ranch, and it was the perfect venue for them. 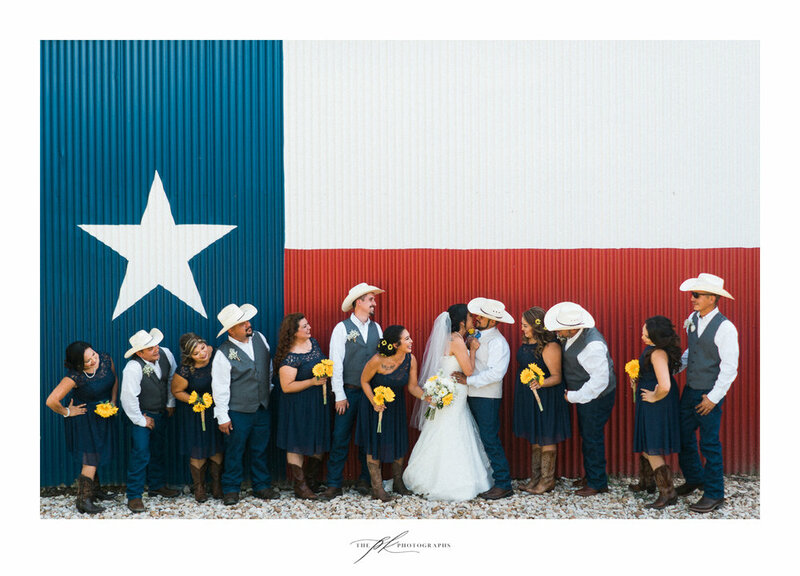 A huge Texas flag on the side of the barn, the cowgirl boots & cowboy hats, the perfect color scheme and beautifully arranged flowers. The day started with hair and makeup by Beautee Bliss for the girls, while the guys were getting ready to get ready (aka having a few beers). Meanwhile, Erica's wedding coordinator, Margaret Peche, was putting the finishing touches on the reception area and Rosaleen Canavati was setting up all the beautiful flower arrangements. Time flew by and soon enough it was time to walk up the aisle! A romantic and brief ceremony was briefly interrupted when it was discovered the rings had been forgotten inside, but with the Matron of Honor to the rescue we were quickly back on track. Vows said, rings exchanged, and finally they were pronounced husband and wife! After a few portraits it was time for the wedding reception. After the bridal party entered was Erica and Victor's first dance as husband and wife, followed by the father/daughter dance, dinner, and a great time with family that went by just a little too quickly. 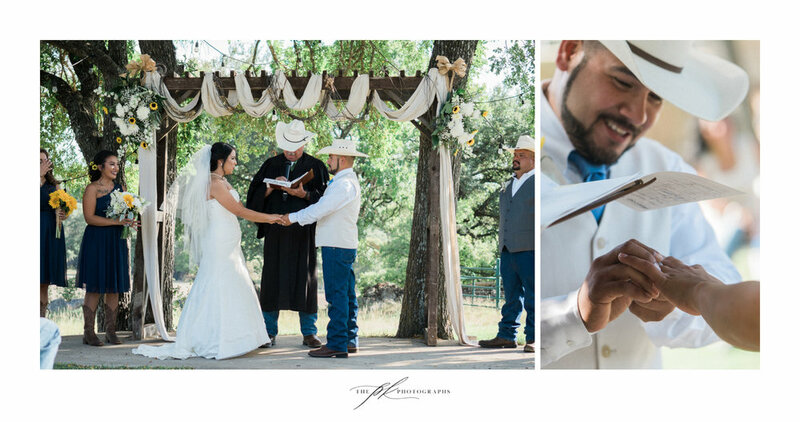 It was so nice to witness such a beautiful wedding that was so perfect for this couple, and so perfectly Texan. Even though it means dealing with the atrociously hot summers of San Antonio, there is no where else I'd rather be a wedding photographer. 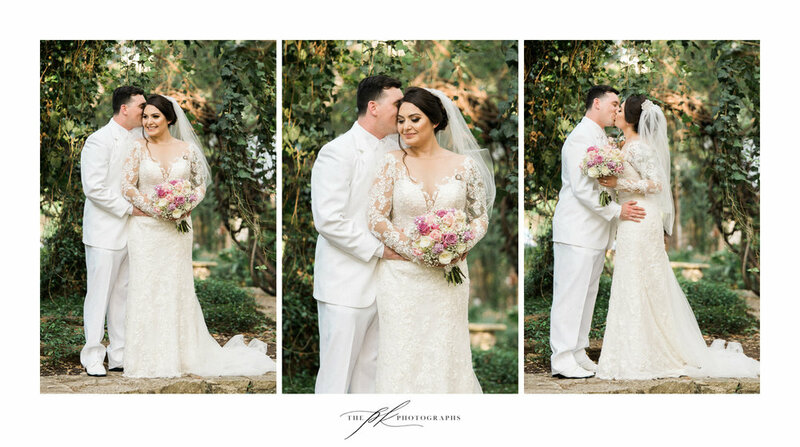 Doug and Rebekah's outdoor wedding at Los Patios is the perfect example of this - it was sweltering, seriously we were all melting for their outdoor ceremony, but it was so stunningly beautiful that it was worth it and I'd do it all over again in a heart-beat to get these gorgeous wedding ceremony photographs. 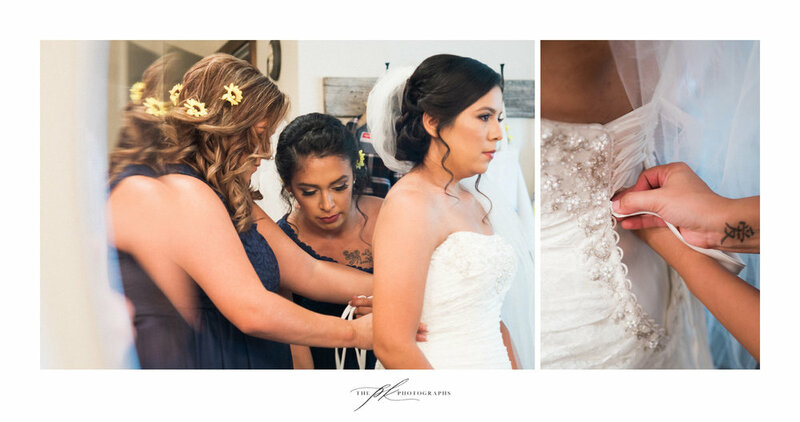 This was my first wedding at Los Patios and if you haven't been there before you need to go check it out - they're more than a wedding venue, they have a ton of small shops, spas, and restaurants. It's the perfect getaway-for-a-day, but right in San Antonio. All the beautiful architecture and landscape makes you feel like you're transported to another, secluded world. There were so many amazing places to take portraits of Doug and Rebekah, including a small bamboo forest. Everything was so beautiful I could have kept shooting them for another hour, but it was just too hot and the A/C of their reception was calling to all of us. One of my favorite little elements of this wedding was how the couple both honored family members that had passed on. 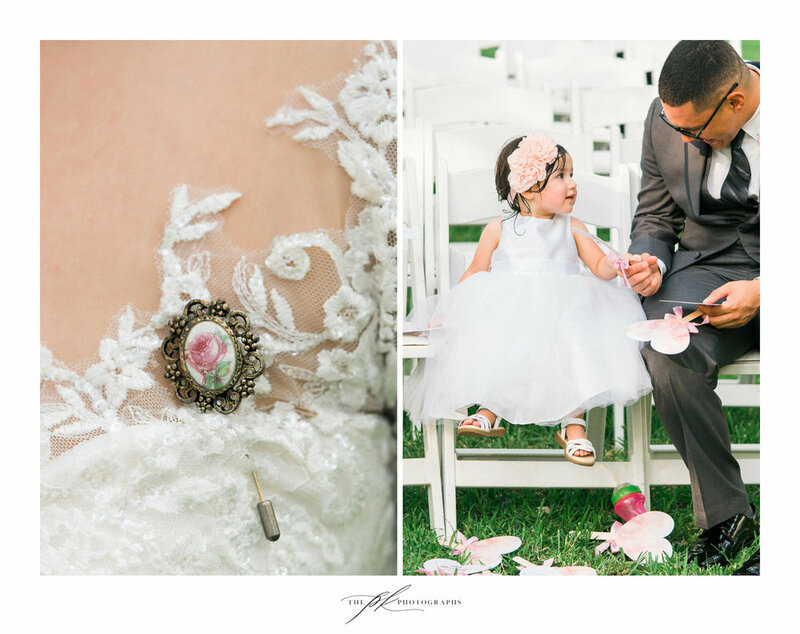 Rebekah had a pin on her wedding dress for her grandmother, and Doug added a four leaf clover to his boutineer for his mother. Their ceremony was very sweet, and I know I wasn't the only one fighting back tears when Doug knelt down to say additional vows to Rebekah's son. After the ceremony we took family and formal bridal party portraits, then finished up with the portraits of just Doug and Rebekah. 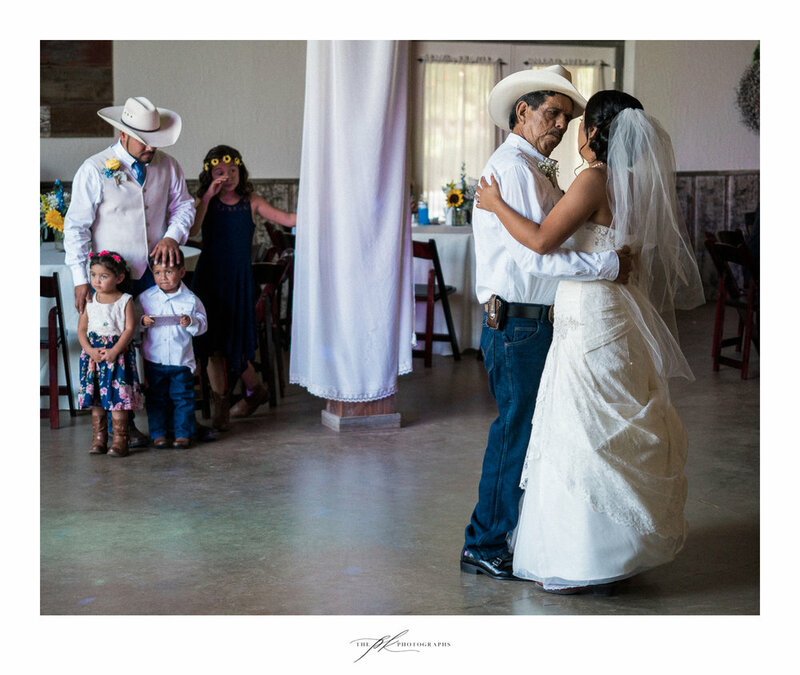 Their wedding reception was just what you would expect from a Texas wedding - fajitas, cake, and a lot of dancing. It was such a beautiful wedding for a beautiful couple, congrats Doug and Rebekah!!! The evening light and the beautiful porch at the Grand Promenade caught my eye, a perfect portrait. As a departure from the typical wedding blog posts I create, this one will is exclusively focused on the photographic art, not the story of the wedding day. I've had people tell me that all of my photographs are great, and while I appreciate the compliment I do not see the majority of my work that way. I'm obsessed and passionate about the light in each image, the composure, the placement of subject against background. As a general rule the wedding photographer doesn't have a whole lot of control over the lighting, location or set-up of the wedding ceremony and reception and those photos are geared towards documenting the event as beautifully as possible, and focusing on the emotion. 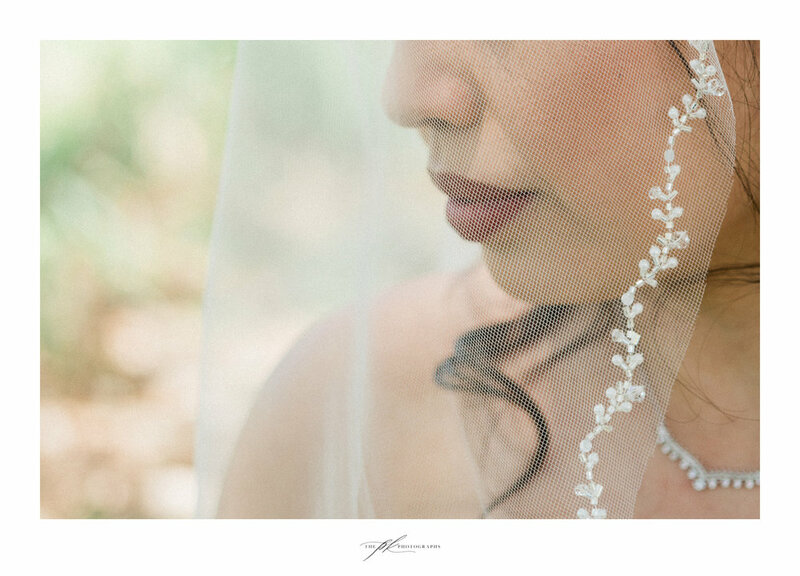 The fine art aspects of the wedding, the detail shots and the portraits are my favorite parts to photograph as an artist because I can truly create art. 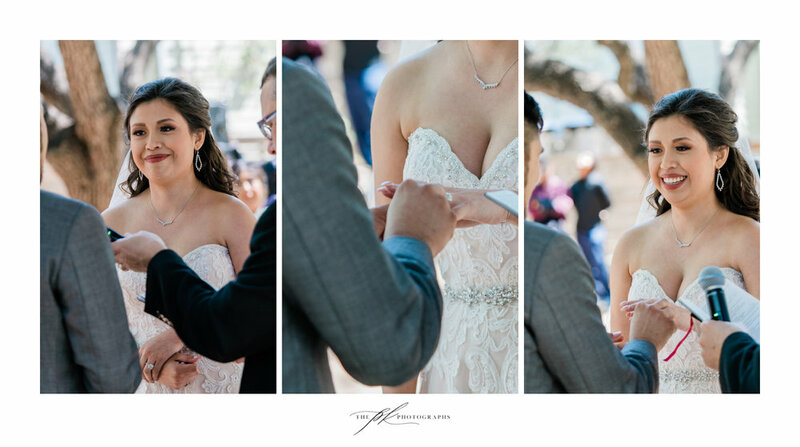 Enjoy the art that is know as wedding photography - personalized and one-of-a-kind artwork created on Allison & Adam's wedding day in downtown San Antonio. 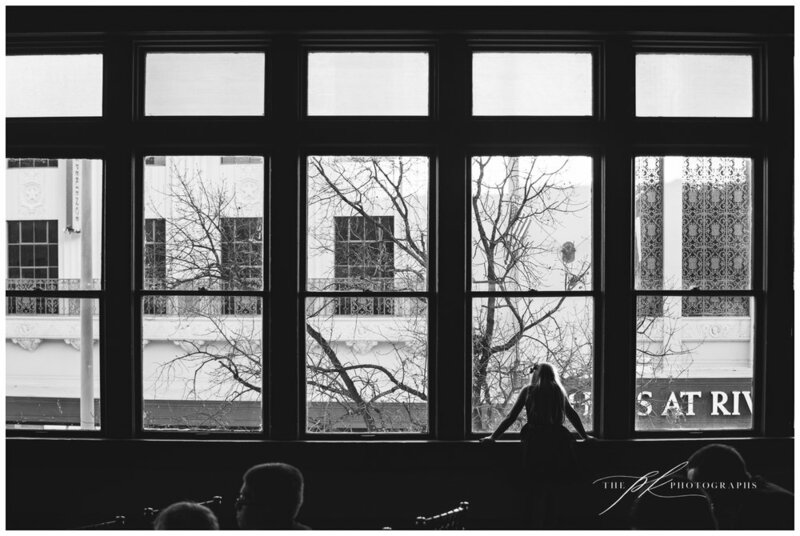 These images were all created at the Menger Hotel, around the Alamo Plaza, and at the Grand Promenade. 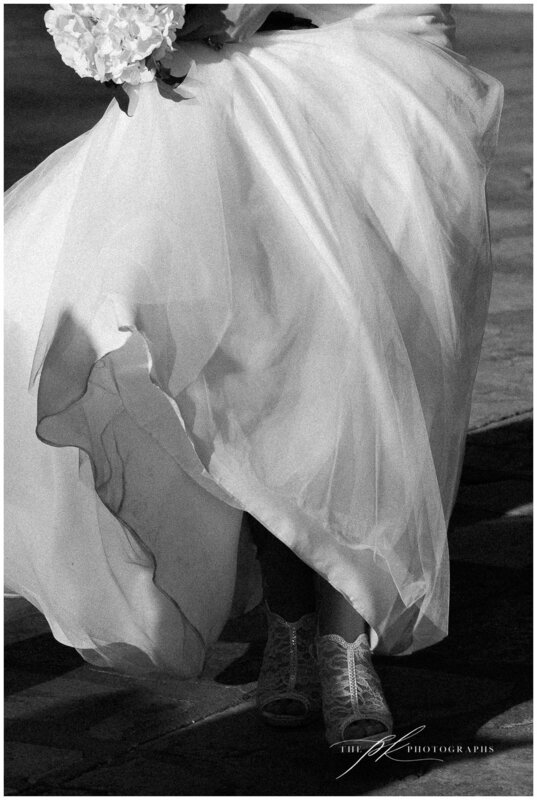 Walking across the Alamo Plaza, Allison's dress and shoes caught the bright sunlight just perfectly. The way she was holding her skirt and the movement in the cloth, the slight peek of her hand holding both her flowers and her dress is just perfect, so the reality of being a bride on her wedding day. Going from one event to the next and the next, yet so beautiful and poised. The Menger Hotel, downtown San Antonio, has simply gorgeous architecture, such a classic look that I had to get a portrait of them here. We were heading outside to the balcony at Menger Hotel for a few photos and I loved the way Adam was holding the door open for Allison. Neither of them are aware I'm taking a photo here, just a small snapshot of them on their wedding day. We took this at the Alamo Plaza, in between tourists walking past. Challenging locations like this force me to be more creative with how I photograph and I love how this image turned out. Obviously suspenders are awesome, so why not show them off a little? Allison went in for that kiss perfectly, and I love how she's actually pulling his suspenders back. During the ceremony I noticed a gorgeous pocket of light (yes I know how crazy that sounds, but there was a skylight!) so right after the ceremony I scooped up a handful of the flower petals from the wedding aisle and had Adam twirl Allison while the petals fell. This was one of those moments during the reception where I was able to create great art while simply documenting. This is an image that is perfect for black and white. This is one of the least "weddingish" images I took on their wedding day. A young girl was standing at one of the window before the ceremony and it caught my eye.